Full disclosure, I love old-time country music. 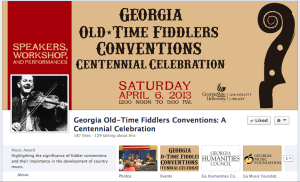 So naturally I jumped at the chance to get Streets of Atlanta Promotions involved with this Georgia State University Library event, Georgia Old-Time Fiddlers Conventions: A Centennial Celebration. And what a time we had. By all accounts the event was a great success, not to mention a heck of a lot of fun too! It was a great experience working with the university’s Special Collections and Archives department. I also found it very rewarding to contribute in promoting Atlanta’s rich and diverse history. 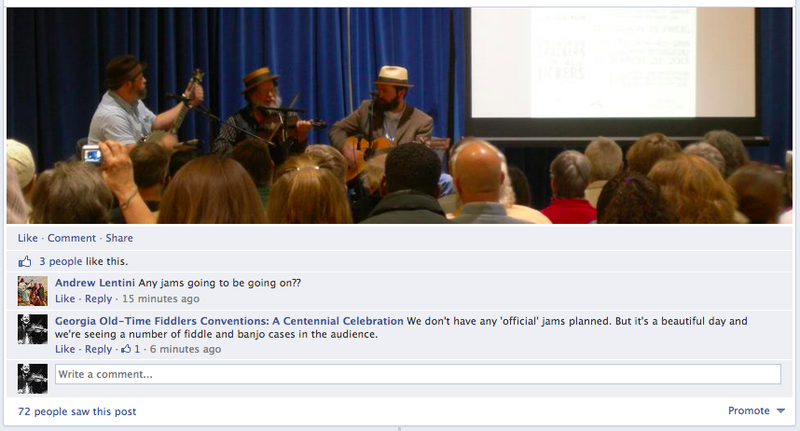 When I came on board the Facebook page had about 60 likes, and the RSVPs had topped out at 50. By the end of the campaign we had over 180 likes on Facebook and 175 people had submitted email RSVPs. I’d estimate that attendance was just over 200 all inclusive. Not bad for some country boys with no paid advertisement whatsoever. 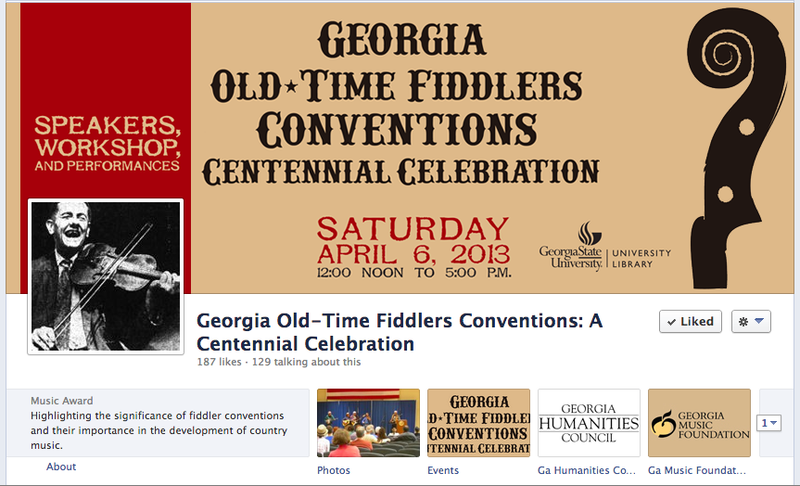 The first step I took in promoting this event was giving the Facebook page a make over. By adding a well designed cover photo, updating the categories to better suit the event, and creating custom tabs for the supporting sponsors, at once the overall appearance of the event was dramatically improved. It’s been my experience, that good design will set the tone for an event. If you aren’t taking your designs seriously, then why should anyone take your event seriously. Next up was to set a tone for the Facebook updates. Working with the archivists at Georgia State University was a great experience. They were passionate about preserving our history. Silly phrases like “Yee Haw!” were never to be used in our brand messaging. But we were able to have a little fun with it. On the example below we felt it was on brand to describe the weather in slang. 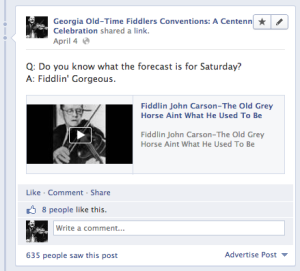 We wouldn’t, however, describe the speakers using slang or use slang words to describe anything to do with the history of the fiddle conventions or upcoming event. One thing we like to see is upward progress. And with our social media strategy we saw exactly that. Looking over the time line, I’m really happy with how our strategy worked out. We started small and generated more and more buzz as the event date came closer. Another interesting note is that the street team distribution started right around March 20. It’s looking like this had a positive effect on the social media strategy as well. As we got to just a few days out from the event, some of the news stories dropped, such as a feature on Creative Loafing and a mention on Scout Mob. During the event we kept the engagement up as well. While working merch for one of the speakers, former GSU instructor Dr. Wayne Daniel, we set up a social media monitoring station. Even though this event was on a relatively small scale, it was a lot of fun to let people know we were actively listening on social networks. And wouldn’t you know it people noticed! Well, you know what they say, “all’s well that plays a little fiddle well” (actually I don’t think anybody has ever said that, ever). It was a great event and an even better time. It’s so rewarding to be in a position where I can help promote the university archives and our rich Atlanta history. I even made some new friends along the way. Hopefully over the coming months I’ll make the time to read through Dr. Wayne Daniel’s book Pickin’ on Peachtree: A History of Country Music in Atlanta, Georgia.